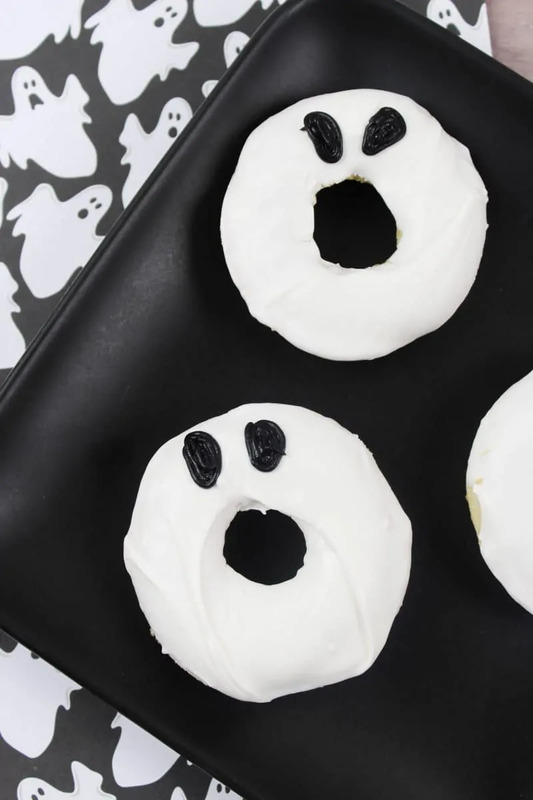 Everyone is sure to love these super cute ghost doughnuts this Halloween. And, you will love how amazingly quick and easy they were to make! Who says the Halloween fun can’t start first thing in the morning? Your kids will love waking up to this sweet treat. Best of all though, these are so easy to make and start with a cake mix of your choice. In other words, you can quickly throw these together the night before or that morning. Other than the cake mix and the normal ingredients you need to prepare it, you just need candy melts and black icing. 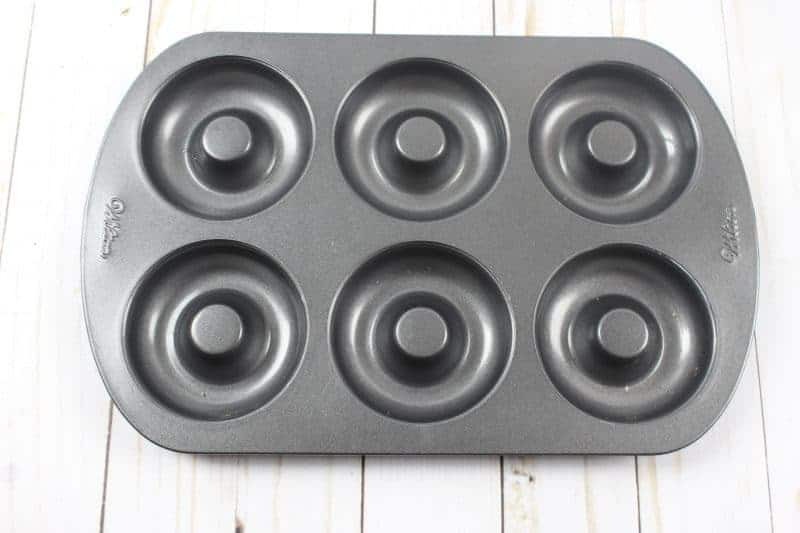 You will also need a good doughnut pan. If you’re looking for an easy Halloween recipe, it doesn’t get any easier than this. 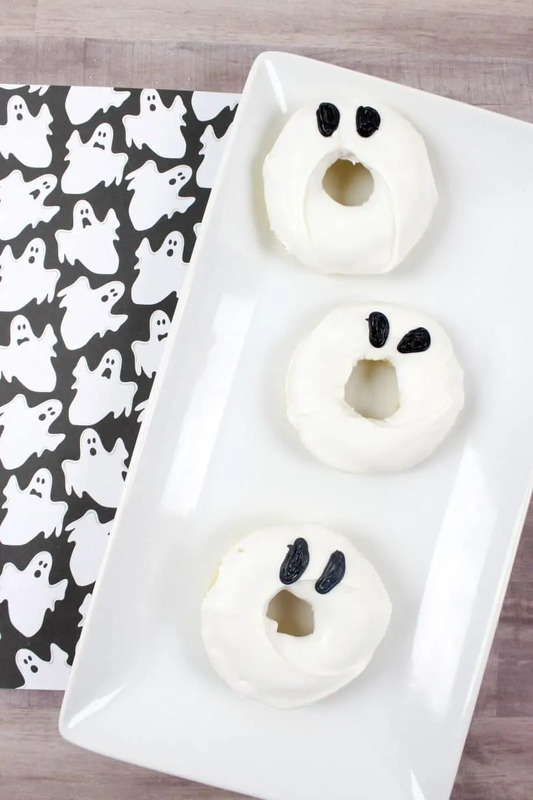 Your kids will love to help decorate these fun Halloween doughnuts. 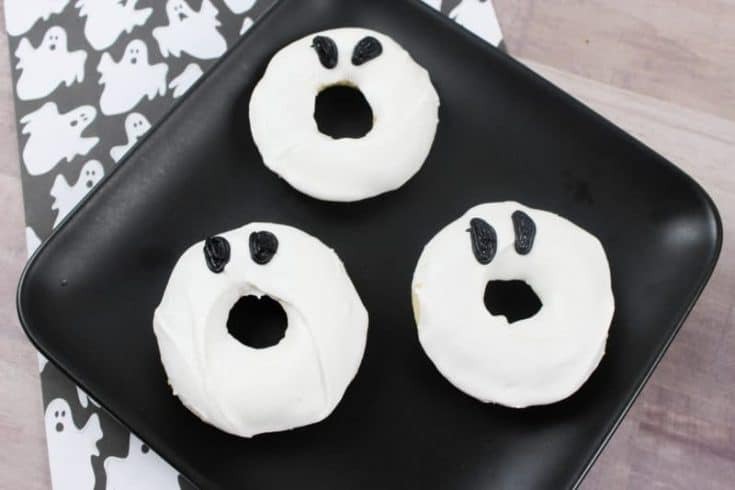 They can help dip the doughnuts in the white chocolate and draw on the ghost's' eyes. 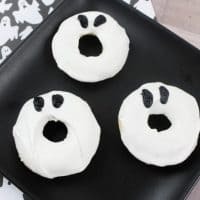 While these are a fun Halloween breakfast option, these would also be perfect for a Halloween party or to take to the office on Halloween. After all, who doesn’t love doughnuts? These would even be perfect for any October bake sale. If you need to make a lot of these, make the doughnuts and freeze. Allow to thaw and come to room temperature before dipping in the candy melts and decorating. This will make it easier to prepare hundreds of these, if necessary. You will find a printable version of the recipe below. Enjoy this spooky treat for Halloween! I hope you enjoyed this recipe and that you and your family have a very happy Halloween! If you liked these Bloodshot Monster Eyeball Doughnuts you will love our Frankenstein Jolly Rancher Suckers, Bloodshot Monster Eyeball Doughnuts, Spiderweb Cupcakes and Mummy Rice Krispie Treats! 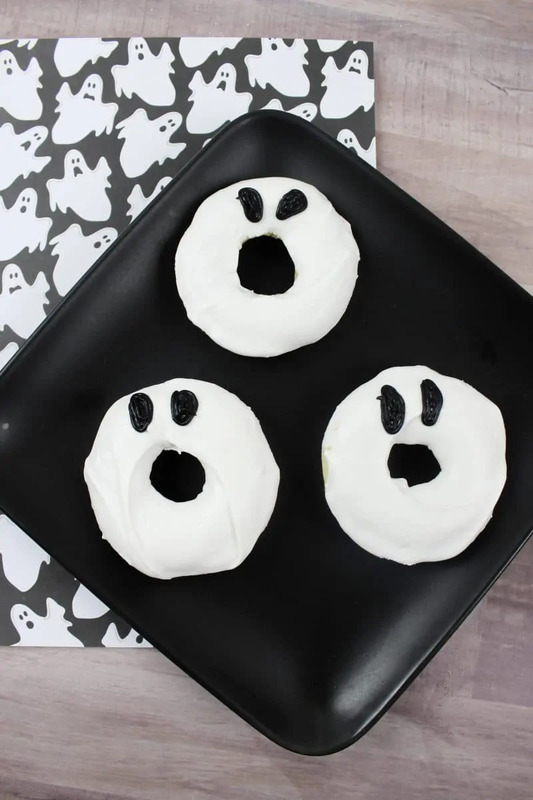 Use the black icing to draw two black ovals for eyes right above the hole in the doughnuts to make it look like a screaming ghost. These turned out adorable! 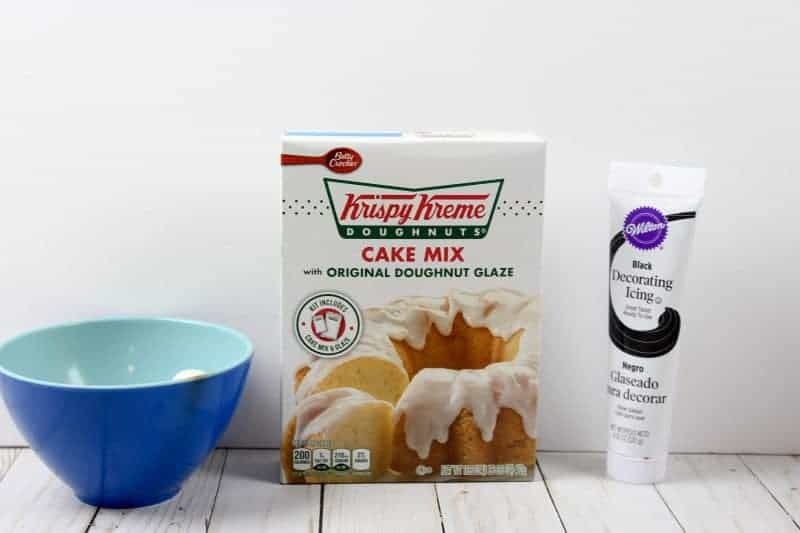 I had no idea that is Krispy Kreme had a cake mix like this, I need to try to find one of these!